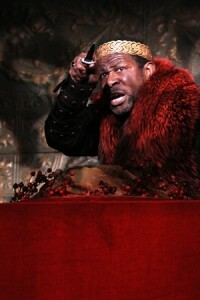 John Douglas Thompson as the title role in Macbeth, 2011. Photo by Gerry Goodstein. We are thrilled to announce that actor John Douglas Thompson, hosted by Theatre for a New Audience, is among the recipients of the Fox Foundation Resident Actor Fellowship by the William & Eva Fox Foundation and Theatre Communications Group (TCG), the national organization for theatre. The program is designed to support actors’ professional and artistic development, to enrich relationships between actors and nonprofit theatres and to ensure continued professional commitment to live theatre. This is the second time Theatre for a New Audience has received this fellowship, having previously hosted actor F. Murray Abraham during his work on William Shakespeare’s The Merchant of Venice and Christopher Marlowe’s The Jew of Malta in 2007. Fox has recognized Thompson as one of two Distinguished Achievement recipients, given to artists who have demonstrated considerable experience in professional theatre with a substantial body of work. Each fellow receives $25,000 awards. As the host theatre company, Theatre for a New Audience receives a grant of $7,500 in support of this residency. With this fellowship, Thompson will expand as a classical actor by preparing himself to play lead roles in Shakespeare’s comedies. John will approach this goal with academic study and comparative analysis of Shakespeare and Marlowe with James Shapiro at Columbia University. He will also explore clown technique with group and individual study with Christopher Bayes, as well as observing rehearsals and performances of Mr. Bayes’ productions of The Servant of Two Masters and The Doctor in Spite of Himself. Thompson will also study how language works in Shakespeare’s comedies and Marlowe’s tragedies with Andrew Wade. He will perform in readings of three Marlowe tragedies and three Shakespeare comedies led by the Theatre’s Associate Artistic Director Arin Arbus (Othello, Macbeth) and other directors. In addition to performing with us, John has performed at American Repertory Theater, Chicago Shakespeare Theater, Royal Shakespeare Company, Hartford Stage, Shakespeare & Company, Yale Rep, Irish Rep, Wilma Theater, Red Bull, and New York Theatre Workshop. He received OBIE, Lucille Lortel, and Callaway Awards for his performance of Othello at Theatre for a New Audience, and a Callaway Award for The Emperor Jones at Irish Rep. The William & Eva Fox Foundation was established in 1987 by Belle Fox in honor of her parents, who founded the Fox Film Corporation. The Foundation has awarded more than $2.7 million in fellowships to 296 actors since 1994. The Fox Foundation is the largest US grant maker dedicated to the artistic and professional development of theatre actors, and one of very few that provides direct financial support to individual actors. For more information on the Fox Foundation Fellowship, click here.